Ureterocalicostomy (UCO) is a procedure used to anastomose nondilated healthy ureter proximal to the lower calyceal system, which is exposed via amputation of the most dependent portion of the lower pole of the kidney, in order to bypass severe peripelvic fibrosis with a ureteropelvic junction (UPJ) obstruction or a long proximal ureteral stricture if the renal pelvis is scarred or intrarenal in location. See image below. Diagram of ureterocalicostomy procedure. The left image shows an obstructed kidney with an intrarenal pelvis with dotted lines delineating the areas of the surgical resection. 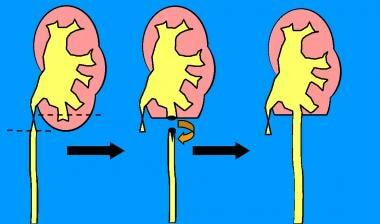 The middle image depicts the kidney following division of the ureter distal to the obstruction and resection of the lower pole of the kidney. The right image is a representation of the ureter anastomosed to the lower-pole calyx. Originally described by Neuwirt in 1947,  ureterocalicostomy was slow to gain popularity. The small number of cases was due, in part, to the limited number of appropriate cases and the high restricture rate. Modern ureterocalicostomy was described by Hawthorne et al in 1976. Prior to these authors' innovations, ureterocalicostomy was performed with minimal resection of lower-pole tissue and was prone to anastomotic stricture and obstruction. Hawthorne et al introduced the importance of generous resection of the lower pole, extending cephalad to the intended calyx to be anastomosed to the ureter, in order to free the ureterocaliceal anastomosis from the surrounding cortical tissue. As prenatal ultrasonography has increased the number of UPJ obstruction diagnoses and subsequent procedures used to correct the condition, complications of pyeloplasty have increased the need for this procedure. Peripelvic fibrosis, a scarred contracted renal pelvis, or an intrarenal pelvis in combination with a proximal ureteral stricture may prevent UPJ reconstruction by standard pyeloplasty or endopyelotomy. Two surgical options remain in this situation: ureteropyelostomy and ureterocalicostomy. Ureteropyelostomy (anastomosing the healthy ureter to the renal pelvis) is preferred, but, if ureteral length is insufficient to perform a tension-free anastomosis (even when combined with a psoas hitch and/or nephropexy), ureterocalicostomy is an option. The kidney is doomed without surgical correction of the obstruction. With the advent of endoscopic surgical procedures, ureterocalicostomy is also used to manage failed endourological procedures or complications caused by them. The most common indication for ureterocalicostomy is proximal ureteral stricture in combination with pelvic fibrosis or intrarenal pelvis occurring after multiple failed pyeloplasty attempts. Fortunately, this is extremely rare. Fewer than 0.5% of patients who undergo pyeloplasty subsequently require salvage with ureterocalicostomy. Even more scarce are cases requiring ureterocalicostomy for a horseshoe kidney, ischemic fibrosis of the renal pelvis/ureter in renal transplants, traumatic avulsion of the proximal ureter and/or renal pelvis, extensive fibrosis following surgery for upper urinary tract stone disease, or following ablative techniques such as cryotherapy and radiofrequency ablation of lower pole renal masses. Peripelvic fibrosis with long proximal ureteral strictures is usually the result of a failed pyeloplasty or other surgical procedures, stone disease, inflammatory processes, or trauma. Occasionally, similar severe obstruction can be observed in transplanted kidneys in which the transplanted ureter became devascularized during harvest. Horseshoe kidneys have also been salvaged with ureterocalicostomy. Histologic findings of benign proximal ureteral strictures are nonspecific. Scar formation with collagen deposition and inflammatory infiltrate may be prominent. The obstruction can result in impairment of renal function, pain, infection, and/or stones. Clinical symptoms of obstruction include urosepsis, failure to thrive, flank pain or mass, and hematuria. As first described by Dietl, the episodes of flank pain, nausea, and vomiting may present during periods of rapid diuresis with large volumes of liquid intake (so-called Dietl crisis). This may manifest only after consumption of liquids that promote brisk diuresis, such as beer or coffee. Most patients who require ureterocalicostomy have a history of pyeloplasty, other urinary tract surgery (including ureteroscopy and endopyelotomy), stones, cancer, or trauma. When pyeloplasty attempts for UPJ obstruction have failed and result in significant peripelvic fibrosis or a relatively long gap between the renal pelvis and the nonobstructed proximal ureter, the kidney can be salvaged with anastomosis of the proximal ureter directly to the lower calyceal system. This technique (ie, ureterocalicostomy) may also be used as the primary reconstructive procedure when a UPJ obstruction or proximal ureteral stricture is associated with a relatively small intrarenal pelvis. In this situation, repeat open or percutaneous pyeloplasty and balloon dilation carry high restricture rates. If an extended length of ureter is not involved in the fibrotic/stenotic process, retrograde endopyelotomy with an Accusize catheter or ureteropyelostomy should be attempted before resorting to other types of repair, including ureterocalicostomy, ileal interposition, and autotransplantation. Ureterocalicostomy is also a useful option when the UPJ is associated with a horseshoe or malrotated kidney in which a standard pyeloplasty does not result in dependent drainage of the collecting system. Alternatives to ureterocalicostomy include autotransplantation with or without a Boari flap pyelovesicostomy; [4, 5] ileal interposition graft; long-term nephrostomy tube or ureteral stent placement; renal capsule, peritoneal, or pericardial flap;  Davis intubated ureterotomy,  buccal mucosa graft, [8, 9] and nephrectomy. The decision to perform a nephrectomy must be based on the level of function in the obstructed kidney and the function of the contralateral kidney. If the renal function of the affected kidney is less than 25%, surgical correction has a high risk for failure, and nephrectomy may ultimately be required. If the patient's renal function is less than 10%, recovery is unlikely and initial nephrectomy may be most appropriate. The ureteral length is 20-30 cm, depending on the individual's height. The lumen size is 4-10 mm in circumference, depending on its location. The narrowest areas are the UPJ, the overpass by the ureter where it crosses over the bifurcation of the iliac arteries, and the ureterovesical junction (UVJ). In both men and women, the ureter courses posterior to the gonadal vessels and anterior to the iliopsoas muscles, crosses the common iliac artery and vein, and enters inferiorly into the pelvis. In men, the vas deferens loops anterior to the ureter prior to the ureter entering the bladder. In women, the ureter courses posterior to the uterine arteries (hence the "water under the bridge" analogy) and is in close proximity to the uterine cervix prior to reaching the intramural bladder. The ureteral blood supply comes from multiple sources. Superiorly, the renal artery may branch and supply the ureter, along with the gonadal artery. As the ureter courses through the retroperitoneum, the aorta contributes numerous small branches. In the pelvis, the iliac, vesical, uterine, and hemorrhoidal arteries also contribute to the blood supply of the ureter. The venous drainage is paired with the arteries. Knowledge of this vascular supply is crucial in ureteral surgery, because a devascularized ureter is subject to complications of stricture and leak. Lymphatic drainage of the upper ureter joins the renal lymphatics to the lumbar nodes. The middle ureter drains to the common and internal iliac nodes. The lymphatic vessels of the pelvic ureter drain to the internal iliac and vesical nodes. For more information about the relevant anatomy, see Ureter Anatomy and Kidney Anatomy. The major contraindication to any ureteral stricture surgery is an active and untreated urinary tract infection. A relative contraindication is uncorrected bleeding diathesis. If the patient has a terminal malignancy, is extremely elderly, or has a high surgical risk and tolerates internal stenting well, then long-term stenting may be most appropriate. If the patient's renal function is less than 10%, then recovery is unlikely and initial nephrectomy may be most appropriate. Ureteral obstruction due to retroperitoneal malignancy, lymphadenopathy, or retroperitoneal fibrosis is a relative contraindication to ureterocalicostomy. Strictures due to urinary tuberculosis that have not been treated medically and have been stable for less than 3-6 months are also a contraindication because postinflammatory scarring may continue to develop. If the length of the ureteral defect prohibits performance of a tension-free ureterocalyceal anastomosis, autotransplantation or ileal interposition is more appropriate. The presence of malignancy, primarily transitional cell carcinoma, is a contraindication to ureterocalicostomy. However, peripelvic and focal proximal ureteral fibrosis resulting from endoscopic resection of transitional cell carcinoma or curative chemotherapy and/or radiation for retroperitoneal malignancy may be amenable to ureterocalicostomy, but such cases are rare. Neuwirt K. Implantation of the ureter into the lower calyx of the renal pelvis. In: VII Congres de la Societe Internationale d'Urologie, part 2. 1947. 253-55. Hawthorne NJ, Zincke H, Kelalis PP. Ureterocalicostomy: an alternative to nephrectomy. J Urol. 1976 May. 115(5):583-6. [Medline]. Srivastava D, Sureka SK, Yadav P, Bansal A, Gupta S, Kapoor R, et al. Ureterocalicostomy for Reconstruction of Complicated Ureteropelvic Junction Obstruction in Adults: Long-Term Outcome and Factors Predicting Failure in a Contemporary Cohort. J Urol. 2017 Dec. 198 (6):1374-1378. [Medline]. Deweerd JH, Paulk SC, Tomera FM, Smith LH. Renal autotransplantation for upper ureteral stenosis. J Urol. 1976 Jul. 116(1):23-5. [Medline]. Boonjindasup A, Smith A, Paramesh A, Rittenberg D, Buell J, Killackey M, et al. A Rationale to Use Bladder Boari Flap Reconstruction for Late Kidney Transplant Ureteral Strictures. Urology. 2016 Mar. 89:144-9. [Medline]. Thüroff JW, Hutschenreiter G, Frohneberg D, Hohenfellner R. Transplantation of a free peritoneal patch in surgery of the renal pelvis and ureter. Eur Urol. 1981. 7(5):304-11. [Medline]. Wesolowski S, Borkowski A. [Late results of surgical treatment of pelvo-ureteral stenosis by the Davis intubated ureterotomy method]. Pol Przegl Chir. 1975 Jun. 47(6A):821-9. [Medline]. Tsaturyan A, Akopyan K, Levonyan A, Tsaturyan A. Long ureteric stricture replacement by buccal mucosa graft: an Armenian experience case series report. Cent European J Urol. 2016. 69 (2):217-20. [Medline]. [Full Text]. Lee Z, Keehn AY, Sterling ME, Metro MJ, Eun DD. A Review of Buccal Mucosa Graft Ureteroplasty. Curr Urol Rep. 2018 Mar 1. 19 (4):23. [Medline]. Gill IS, Cherullo EE, Steinberg AP, Desai MM, Abreu SC, Ng C, et al. Laparoscopic ureterocalicostomy: initial experience. J Urol. 2004 Mar. 171(3):1227-30. [Medline]. Terai A, Kamoto T, Ogawa O. Retroperitoneoscopic ureterocalicostomy for congenital proximal ureteral stenosis. Urology. 2004 May. 63(5):982-4. [Medline]. Radford AR, Thomas DF, Subramaniam R. Ureterocalicostomy in children: 12 years experience in a single centre. BJU Int. 2011 Aug. 108(3):434-8. [Medline]. Osman T, Eltahawy I, Fawaz K, Shoeib M, Elshawaf H, El Halaby R. Ureterocalicostomy for treatment of complex cases of ureteropelvic junction obstruction in adults. Urology. 2011 Jul. 78(1):202-7. [Medline]. Mufarrij PW, Shah OD, Berger AD, Stifelman MD. Robotic reconstruction of the upper urinary tract. J Urol. 2007 Nov. 178(5):2002-5. [Medline]. Casale P, Mucksavage P, Resnick M, Kim SS. Robotic ureterocalicostomy in the pediatric population. J Urol. 2008 Dec. 180(6):2643-8. [Medline]. Chhabra JS, Balaji Sudharsan S, Singh A, Mishra S, Ganpule A, Sabnis R, et al. Robot-assisted ureterocalycostomy: A single centre contemporary experience in adults. Arab J Urol. 2016 Mar. 14 (1):25-30. [Medline]. Gupta CL, Bapna BC, Rao MS. Ureterocalycostomy for postpyelolithotomy stenosis after failure of intubated infundibuloplasty. Urology. 1980 Aug. 16(2):190-3. [Medline]. Bayne CE, Peters CA. Congenital infundibulopelvic stenosis: Indications for intervention, surgical technique, and review of literature. J Pediatr Urol. 2016 Jun 21. [Medline]. Naude JH. Buccal mucosal grafts in the treatment of ureteric lesions. BJU Int. 1999 May. 83(7):751-4. [Medline]. Tsaturyan A, Akopyan K, Levonyan A, Tsaturyan A. Long ureteric stricture replacement by buccal mucosa graft: an Armenian experience case series report. Cent European J Urol. 2016. 69 (2):217-20. [Medline]. Atala A. Tissue engineering in urologic surgery. Urol Clin North Am. 1998 Feb. 25(1):39-50. [Medline]. Ambiavagar R, Nambiar R. Traumatic closed avulsion of the upper ureter. Injury. 1979 Aug. 11(1):71-6. [Medline]. Cherullo EE, Gill IS, Ponsky LE, Banks KL, Desai MM, Kaouk JH, et al. Laparoscopic ureterocalicostomy: a feasibility study. J Urol. 2003 Jun. 169(6):2360-4. [Medline]. Dewan PA, Clark S, Condron S. Point of technique: Ureterocalycostomy in the management of pelvi- ureteric junction obstruction in the horseshoe kidney. BJU Int. 1999 Aug. 84(3):366-8. [Medline]. Duckett JW, Pfister RR. Ureterocalicostomy for renal salvage. J Urol. 1982 Jul. 128(1):98-101. [Medline]. Green DF, Lytton B, Glickman M. Ureteropelvic junction obstruction after percutaneous nephrolithotripsy. J Urol. 1987 Sep. 138(3):599-602. [Medline]. Greene KL, Meng MV, Abrahams HM, Freise CE, Stoller ML. Laparoscopic-assisted upper pole ureterocalicostomy using renal inversion and autotransplantation. Urology. 2004 Jun. 63(6):1182-4. [Medline]. Hjort EF, Boe OW. Partial resection of the renal pelvis and lower pole of the kidney for hydronephrosis. Br J Urol. 1971 Aug. 43(4):406-20. [Medline]. Jarowenko MV, Flechner SM. Recipient ureterocalycostomy in a renal allograft: case report of a transplant salvage. J Urol. 1985 May. 133(5):844-5. [Medline]. Kay R. Ureterocalicostomy. Urol Clin North Am. 1988 Feb. 15(1):129-33. [Medline]. Levitt SB, Nabizadeh I, Javaid M. Primary calycoureterostomy for pelvioureteral junction obstruction: indications and results. J Urol. 1981 Sep. 126(3):382-6. [Medline]. Matlaga BR, Shah OD, Singh D, Streem SB, Assimos DG. Ureterocalicostomy: a contemporary experience. Urology. 2005 Jan. 65(1):42-4. [Medline]. Mesrobian HG, Kelalis PP. Ureterocalicostomy: indications and results in 21 patients. J Urol. 1989 Nov. 142(5):1285-7. [Medline]. Mollard P, Braun P. Primary ureterocalycostomy for severe hydronephrosis in children. J Pediatr Surg. 1980 Feb. 15(1):87-91. [Medline]. Moloney GE. Avulsion of the renal pelvis treated by ureterocalycostomy. Br J Urol. 1970 Oct. 42(5):519-21. [Medline]. Rohrmann D, Snyder HM 3rd, Duckett JW Jr. The operative management of recurrent ureteropelvic junction obstruction. J Urol. 1997 Sep. 158(3 Pt 2):1257-9. [Medline]. Ross JH, Streem SB, Novick AC. Ureterocalicostomy for reconstruction of complicated pelviureteric junction obstruction. Br J Urol. 1990 Apr. 65(4):322-5. [Medline]. Selli C, Rizzo M, Moroni F. Ureterocalicostomy in the treatment of pyeloplasty failures. Urol Int. 1992. 48(3):274-7. [Medline]. Smith AD. Management of iatrogenic ureteral strictures after urological procedures. J Urol. 1988 Dec. 140(6):1372-4. [Medline]. Steffens J, Humke U, Haben B, Stark E, Breitling P, Treiyer A. Open ureterocalycostomy. BJU Int. 2008 Feb. 101(3):397-407. [Medline]. Thomas JC, DeMarco RT, Donohoe JM, Adams MC, Pope JC 4th, Brock JW 3rd. Management of the failed pyeloplasty: a contemporary review. J Urol. 2005 Dec. 174(6):2363-6. [Medline]. Wolf JS Jr, Elashry OM, Clayman RV. Long-term results of endoureterotomy for benign ureteral and ureteroenteric strictures. J Urol. 1997 Sep. 158(3 Pt 1):759-64. [Medline]. Twenty-four-year-old veteran who suffered a high-velocity injury in Iraq, including spinal cord injury, multiple bowel perforations, and left ureteral transection. A cutaneous ureterostomy was performed and nephrostomy tube placed emergently at the time of the injury. Other issues stabilized, and he then underwent evaluation for definitive management of ureteral transection. Cutaneous ureterostomy is nonfunctioning. Antegrade nephrostography performed at the time of nephrostomy tube change showed a blind-ending renal pelvis. Thirty-six-year-old patient who underwent two prior attempts at left pyeloplasty, with recurrent obstruction. Nephrostogram shows an obliterated ureteropelvic junction. Postoperative intravenous pyelogram showing drainage from calyx into ureter after ureterocalicostomy. Intraoperative photograph during ureterocalicostomy. The lower pole of the kidney has been identified. The ureter has been dissected and the atretic segment divided. The ureter has been spatulated and anastomosed to the lower pole calyx over a ureteral stent. The fat pad to the left of the anastomosis will be wrapped around the anastomosis and a drain will be placed. Simultaneous retrograde pyelogram and antegrade nephrostogram shows blind-ending renal pelvis and significant defect between pelvis and residual distal ureter. The renal pelvis is not completely obliterated, and it may have been reasonable to consider pyeloplasty if the distal ureter was of sufficient length. However, the proximal portion of residual distal ureter is tortuous, medially deviated, and in the area of a significant amount of prior injury and exploration, which will likely prevent isolating adequate length of viable ureter for ureterocalicostomy. This patient underwent autotransplantation. The lower pole of the kidney has been amputated and the lower pole calyx identified. Both the kidney and ureter are mobilized to allow a tension-free anastomosis. Sixty-one-year-old patient with a history of radiofrequency ablation of left lower-pole renal mass with subsequent fibrosis of the extrarenal portion of the renal pelvis and proximal ureter. Simultaneous antegrade nephrostogram and retrograde pyelogram show a relatively short defect and healthy-appearing distal ureter. A ureteral stent is placed in the distal ureteral segment to aide in intraoperative identification.